Two games this week, both AWI. John the Red came up Monday evening and Rob was here on Wednesday night. I was keen to give the 'revised' BP break test and disorder rules (derived from those used in Hail Caesar) another try out, slightly tweaked to allow for the possibility of having more units in a state of disorder and unable to move than we saw in the game last week. To recap, in BP if a player throws a 6 during shooting, the target unit is automatically disordered. This is not necessarily a physical state, ie as a result of crossing a river or after a melee, but more of a mental/command and control one, where the unit has momentarily lost cohesion due to the effects of officers and NCOs being hit and that effect on command, or the smoke, disorientation and so forth. The Hail Caesar variant simply adds in a further degree of uncertainty. If a 6 is throw the target has to throw on the break test table (slightly amended); they might be absolutely fine, they might be disordered, or even have to retire. The unit could in extreme circumstances break. I also decided to try and reflect the American habit of picking off officers and NCOs. 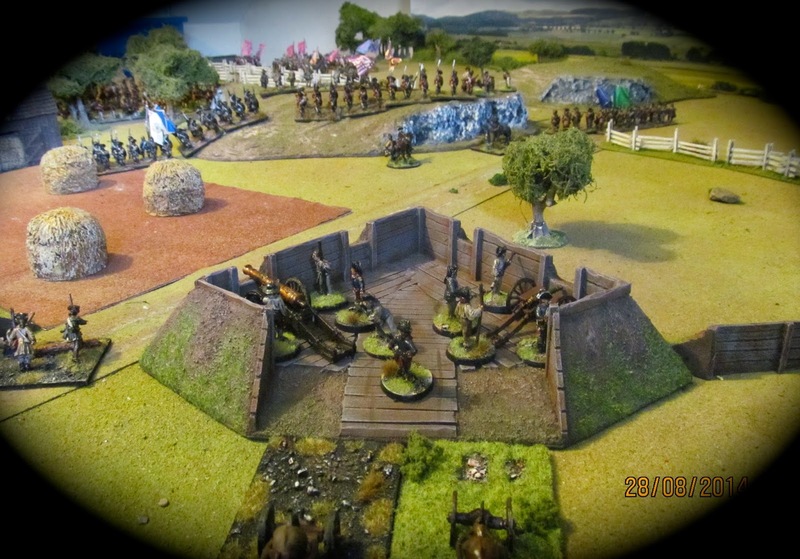 Any unsaved hits from rifle-armed American skirmishers would automatically cause the target unit to become disordered. 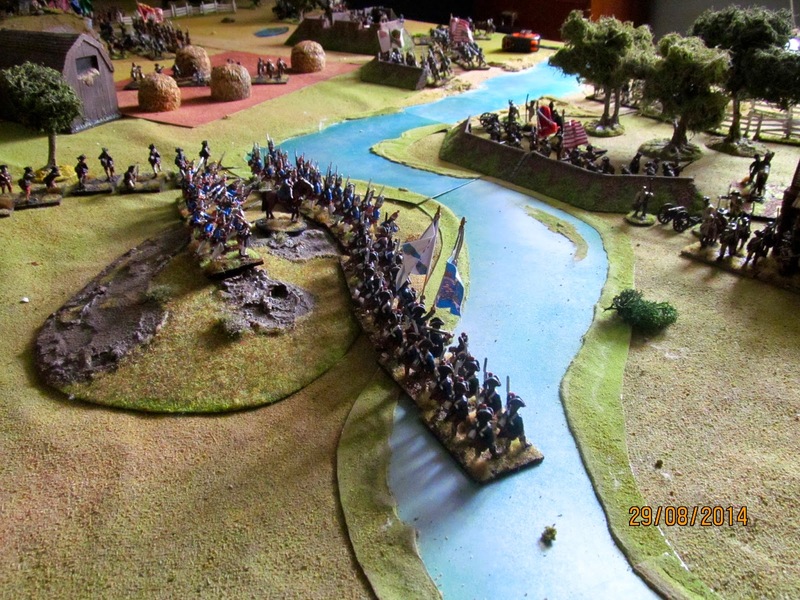 Anyway, Game 1 saw the Americans holding a river crossing defended by a redoubt and some entrenchments against a British attack. 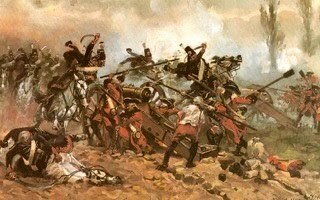 The British objective was to capture the crossing and destroy as many Americans as possible. 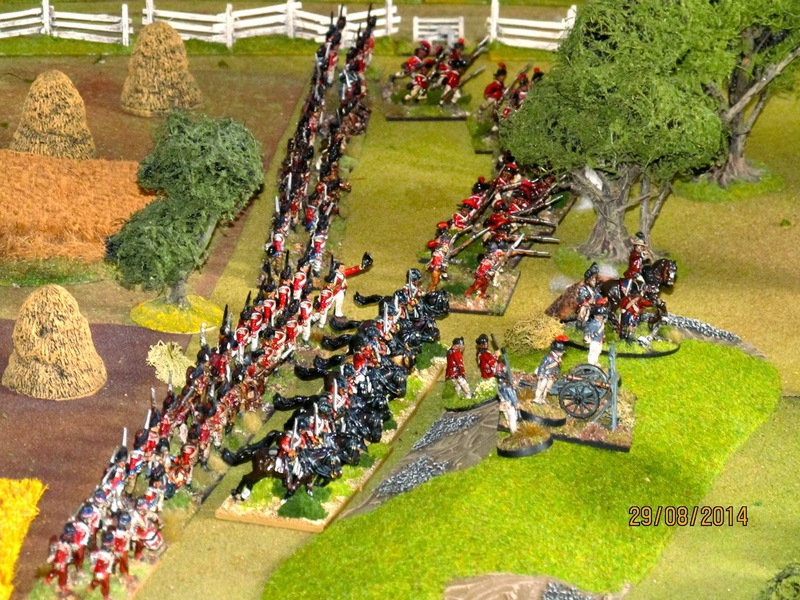 The Americans had to hold and drive off the British. 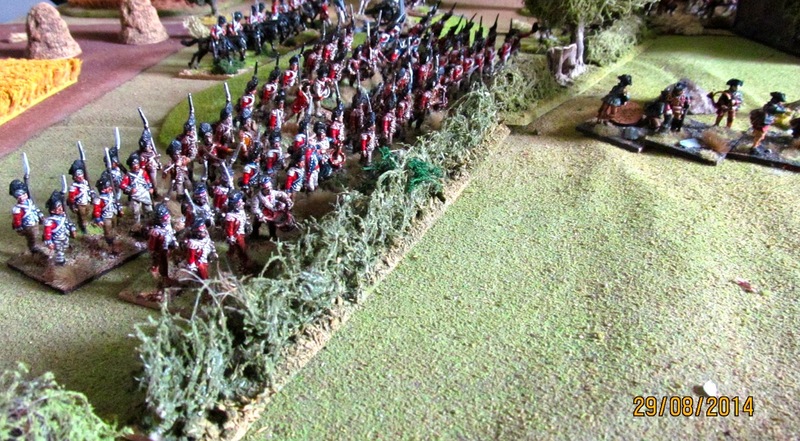 For Game 2 I replaced the Hessian line infantry regiment in the Hessian Grenadier brigade with a third Grenadier battalion (Hinchliffe figures) which I had just finished basing. 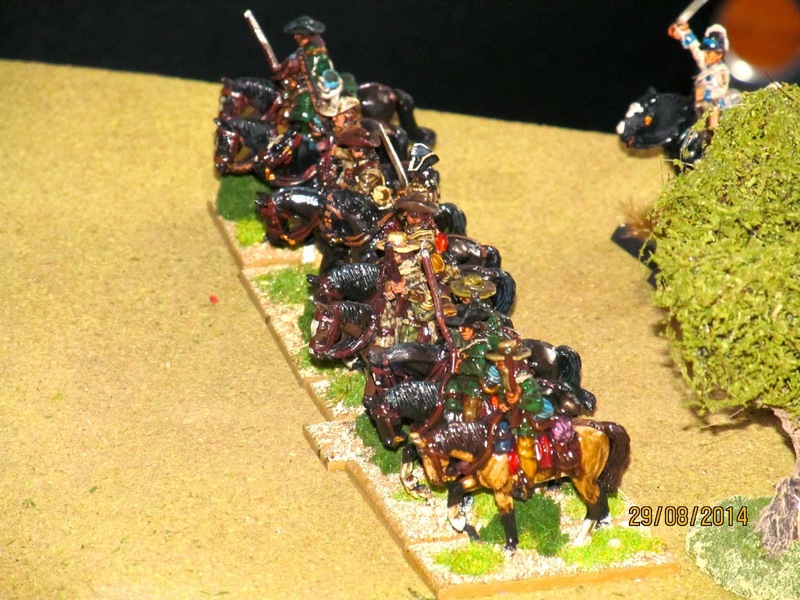 I also swapped the Hessian Fusiliers in the other brigade for another newly-based Hinchliffe battalion. 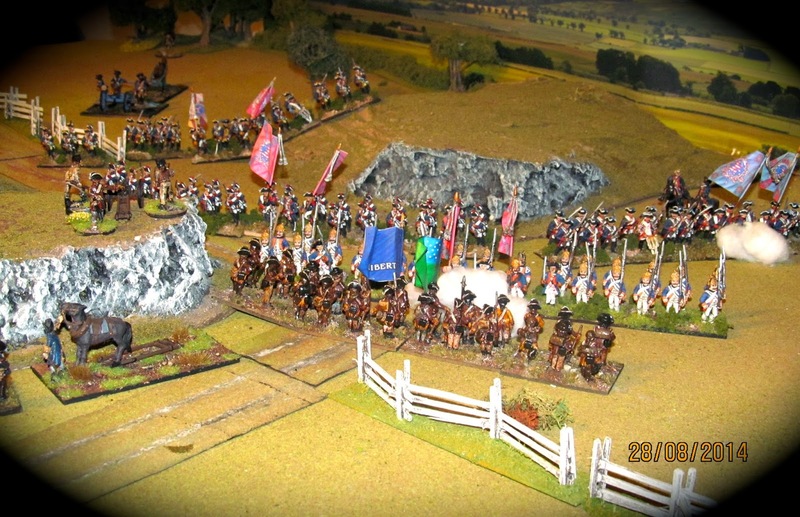 Pictures and a brief commentary for game 1 on Monday with John, who was the British commander, Sir Henry Clinton. 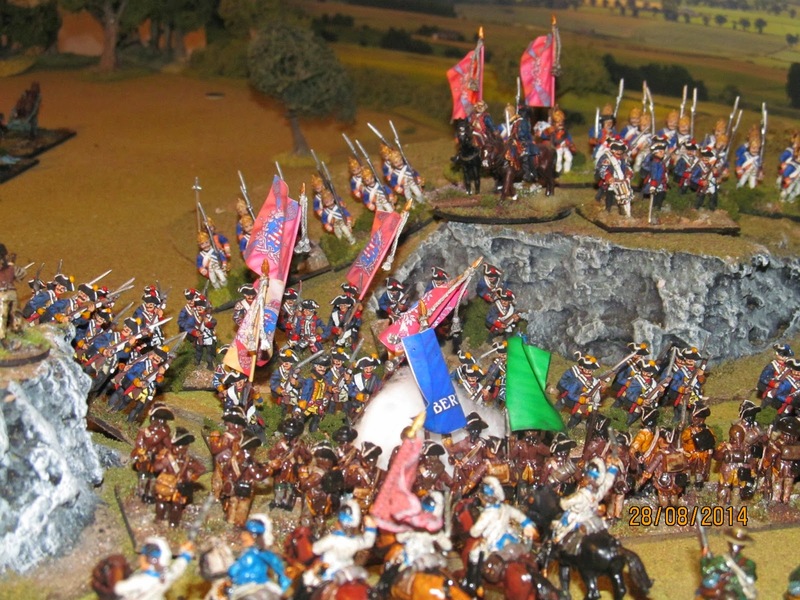 (Above, Continentals and skirmishers holding the hills on the right of their line. 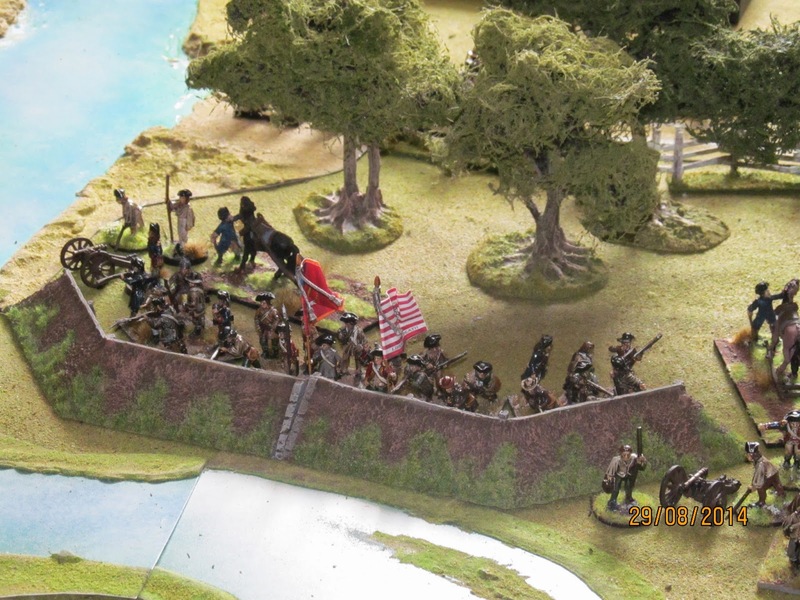 Below, the American redoubt guarding the river crossing). 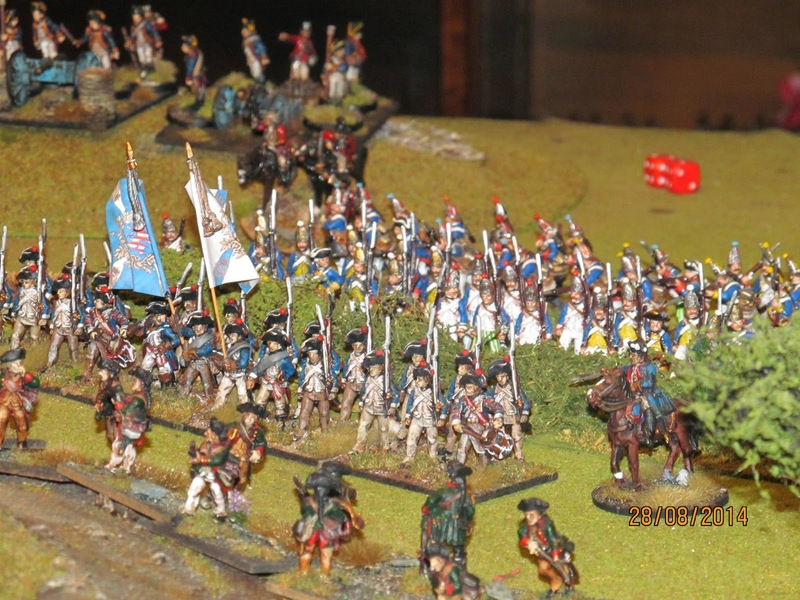 (Above and below, the Hessians made a slow if dignified entry as befits my venerable 25mm Hincliffe figures. 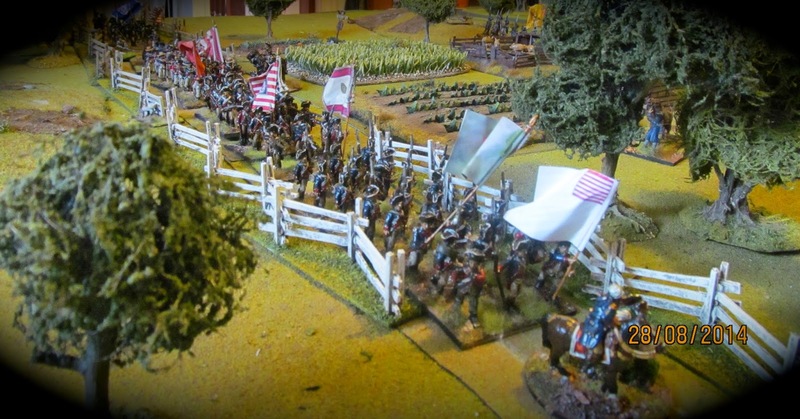 The British Light battalion can be seen engaging with American skirmishers). 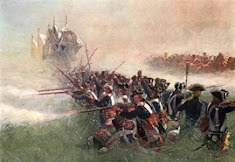 (Above, the Hessians closed with the American right flank and drove them off with the bayonet, taking severe casualties in the process, enough to see the entire brigade spent and unable to take any further part in the battle. 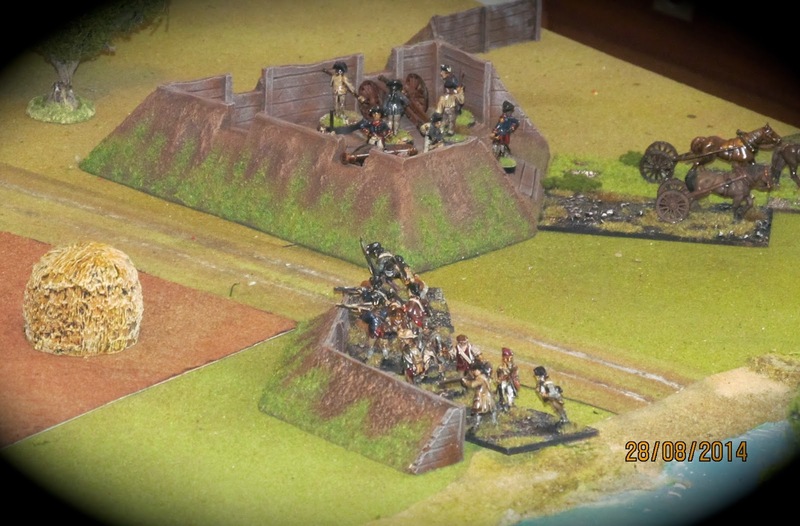 Below, the other Hessian brigade steps forward in an attack on the American centre). 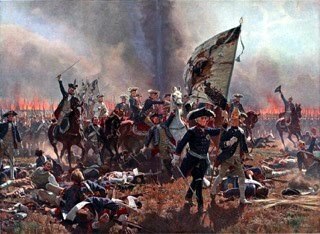 (Above, The Hessians on the American right still pushing on regardless of casualties at this point. 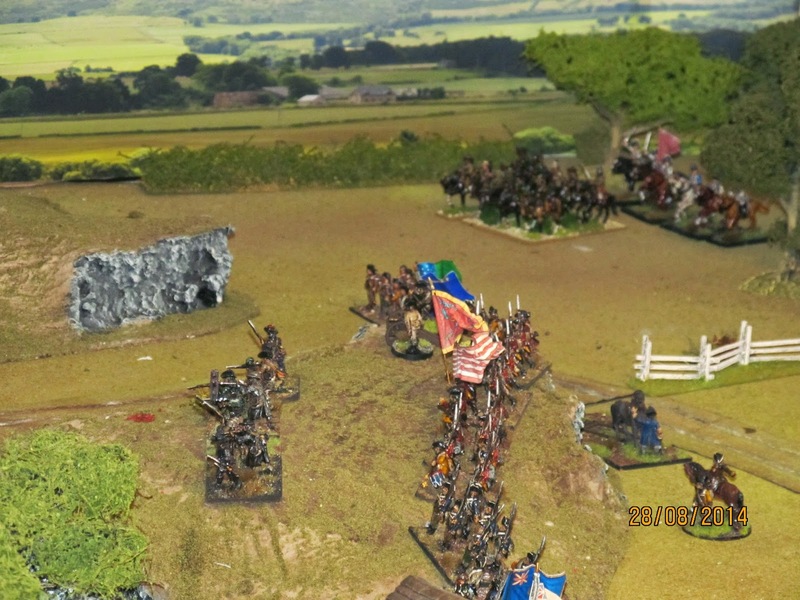 Below, on the other flank the Queen's Rangers have crossed the stream and are advancing on the American left, supported below by Native Americans). 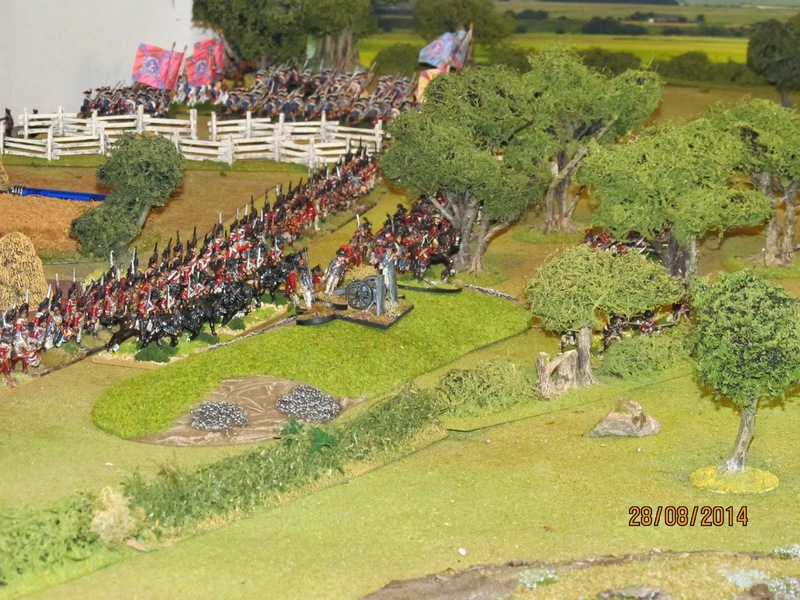 (Above, another view of the very slow Hessian advance in the centre while below the British grenadiers and light dragoons fail to move). 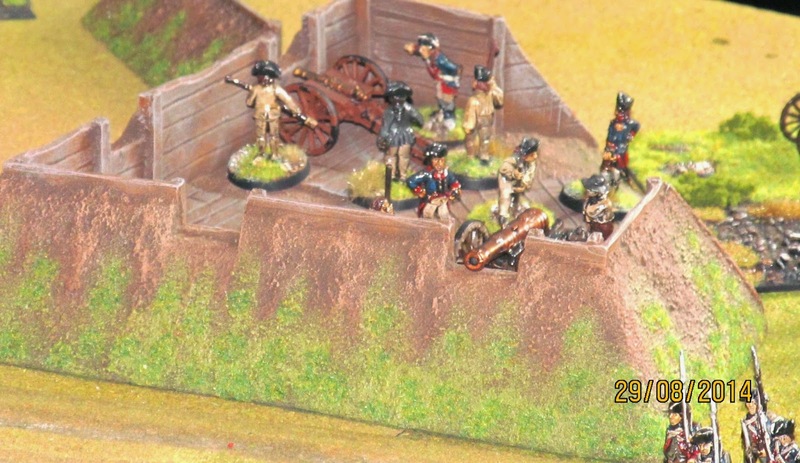 (The American defences: above the redoubt and below the earthworks defended by Virginia militia). 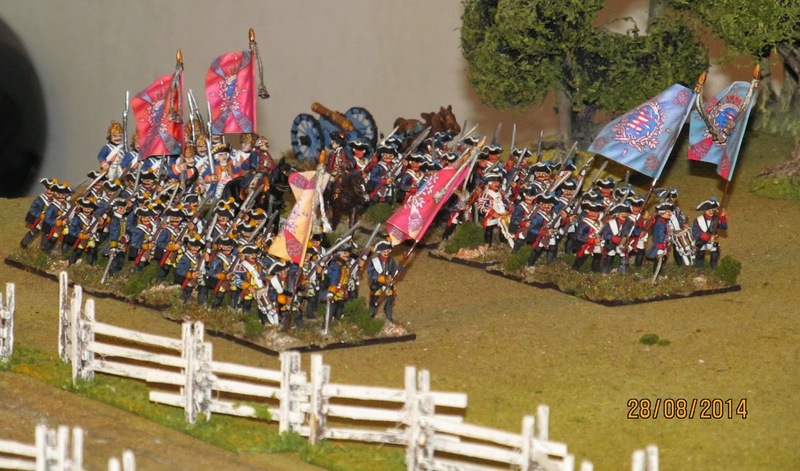 (Above, the Militia mounted rifles supported by the 2nd Continental Dragoons. 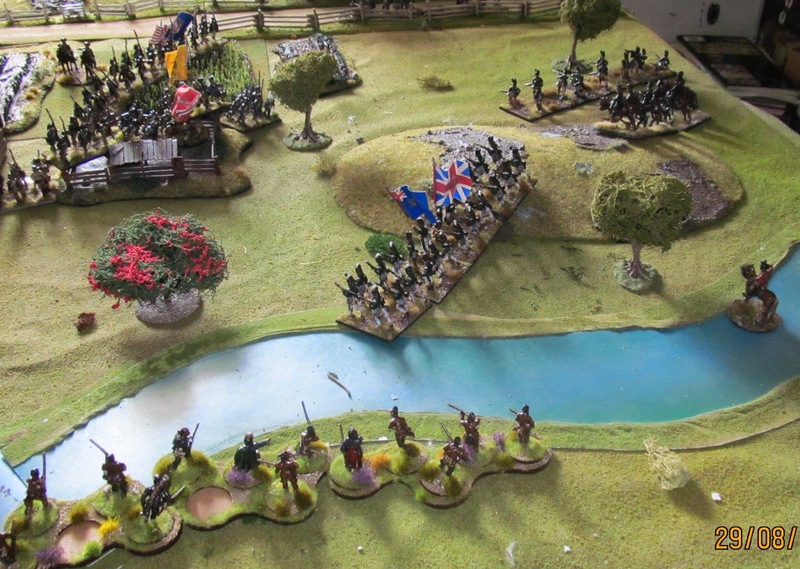 Below, the British right flank engages the Americans and begins to push them back). 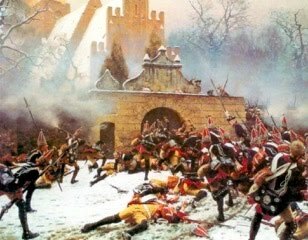 (Above, the Hessian Grenadiers charge and carry the American earthwork, as a result of which the American centre began to buckle). 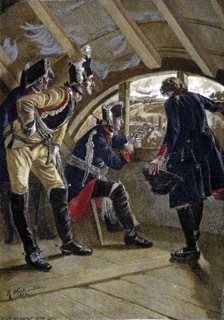 Essentially, the Hessians (after a slow start on the British left) pretty much spent themselves in their attacks on the American line but did severely damage their opponents and kept them out of the battle. 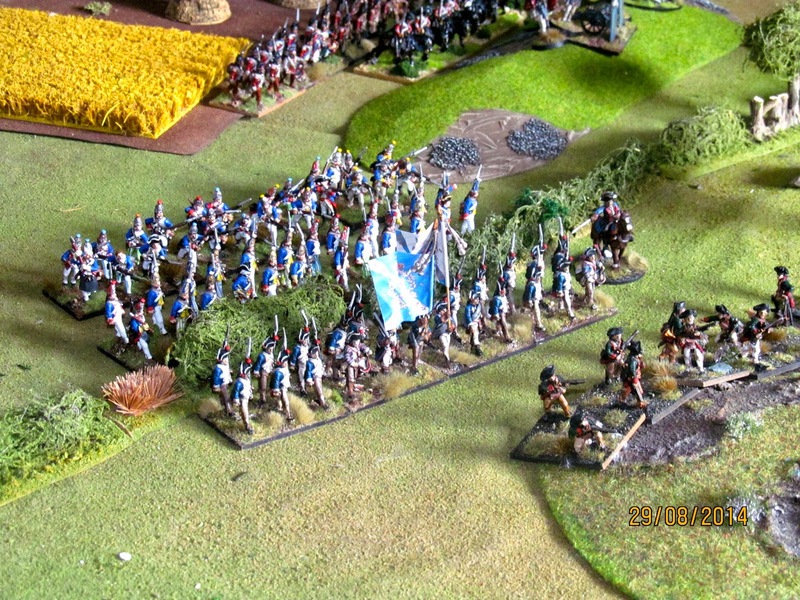 The brigade eventually became shaken thanks to the attention of the Hessians and the Light infantry. 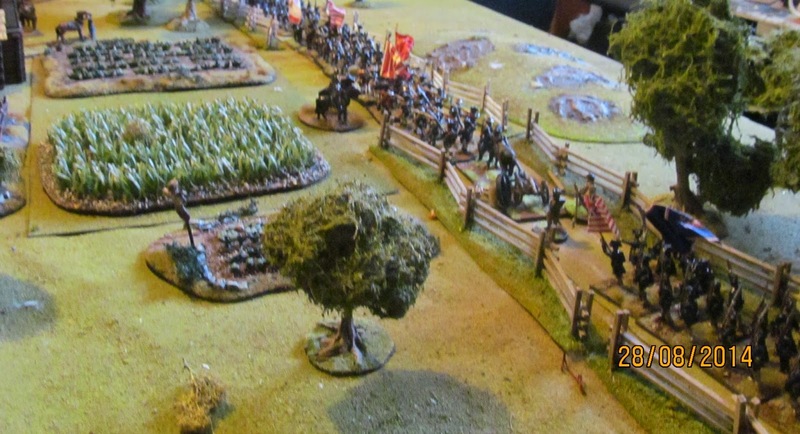 In the centre the combined light battalions made hard work of driving off the Americans on the hill and around the barn but in the end beat them off, shattering the brigade in the process. 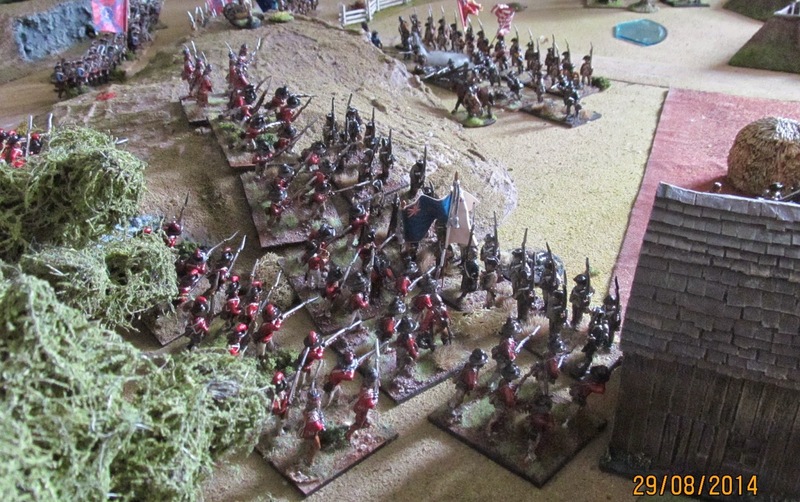 The British Grenadiers were supposed to punch a hole through the American line towards the redoubt but due to some unfortunate command rolls by the time they got into position it was all over! 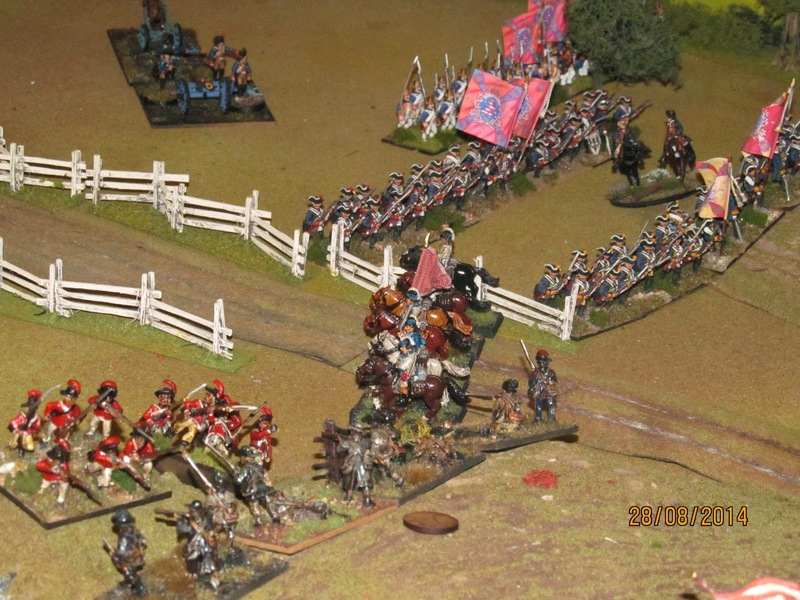 The Hessian Grenadiers took heavy casualties and took several attempts to do so but eventualy made it across the stream and after a sharp melee drove off the militia defenders. 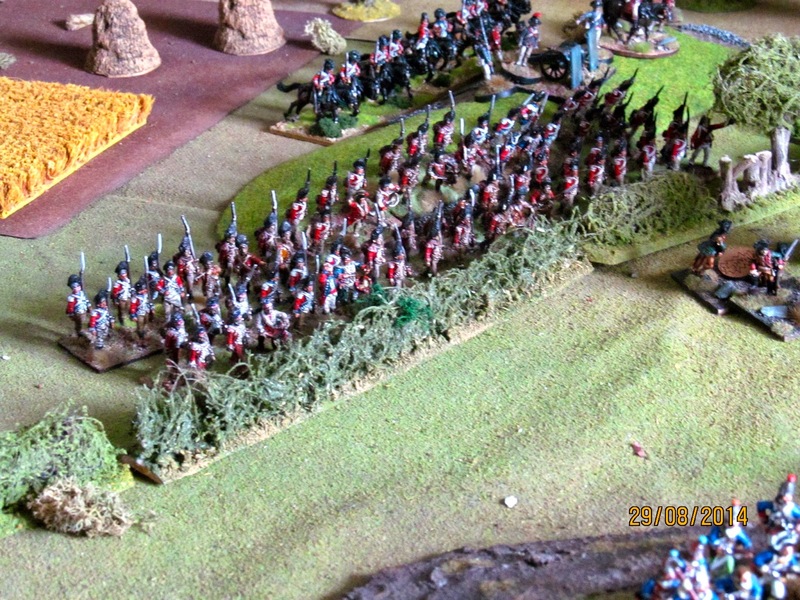 Pressure from the British right flank caused the whole militia brigade to break. 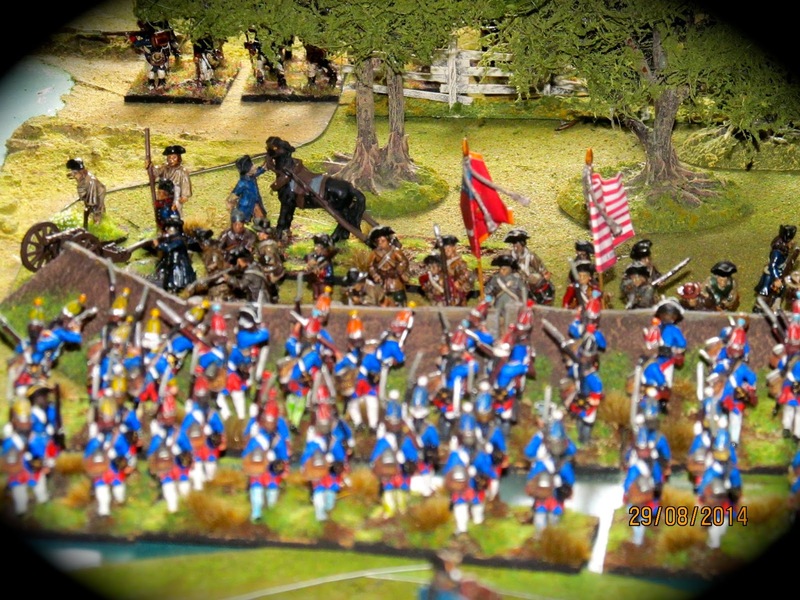 With over half of their forces shaken or dispersed the Americans admitted defeat and that was that. 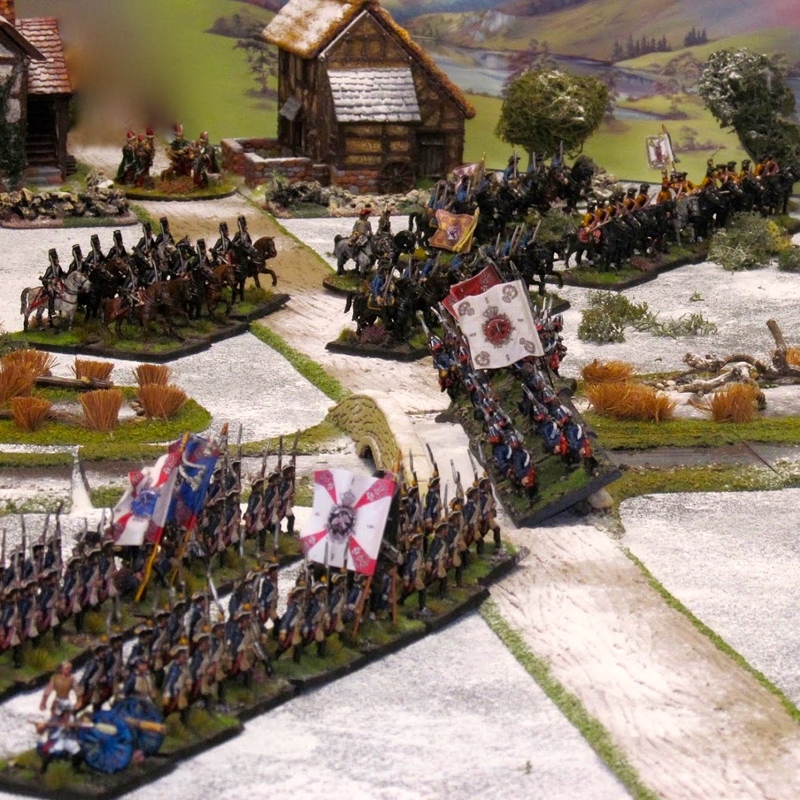 Victory for the British, despite the fact that skin on custard sets quicker than their attack developed! The amendments worked really well. As always, you made a beautiful battle. Photos and table are truly an inspiration to all lovers AWI.